Died: July 26, 1801 Guildford/Randolph Co, N.C. If you are a descendant please email me and I will add you to this page. the Waymire site is no longer at that address. did not survive the trip. With them, they carried a family trunk filled with their belongings. Historical Museum where it remains today. 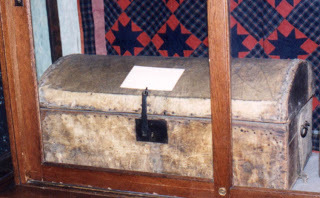 It is covered with the original animal hide and rawhide hinges and straps. One can only imagine the contents and the family value held for generations. his two sisters were separated from the family which was not uncommon. family’s voyage. This may have happened to the Waymire family. been held in this chest.